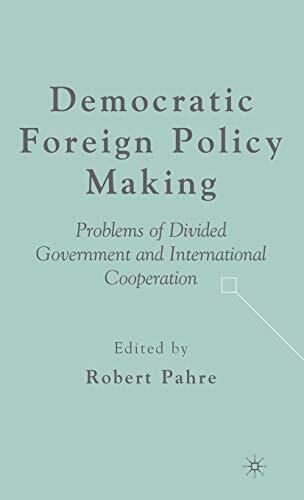 Democratic Foreign Policy Making: Problems Of Divided Government And International Cooperation: 9781403974570 Hardcover - LIMEROCK BOOKS INC. Leading scholars from the United States and the European Union examine how democracies make foreign policy when their citizens disagree. The authors focus in particular on differences of opinion between the legislature and the executive - often called 'divided government' - and the constraints of public opinion on a leader's actions. ROBERT PAHRE is Associate Professor of Political Science and Associate Director of the European Union Centre at the University of Illinois at Urbana-Champaign, USA.